Chem. Commun., 2015, 51, 4032-4035.
c Department of Chemical Engineering & Biotechnology, University of Cambridge, Pembroke Street, Cambridge CB2 3RA, United Kingdom. d Department of Chemistry and FRQNT Centre for Green Chemistry and Catalysis, McGill University, 801 Sherbrooke St. W., Montréal, H3A0B8, Canada. Although mechanochemical synthesis has enabled the rapid, solvent-free synthesis of a number of metal-organic frameworks (MOFs), so far the materials generated by mechanochemistry have, without exception, remained based on simple metal ions as building blocks. 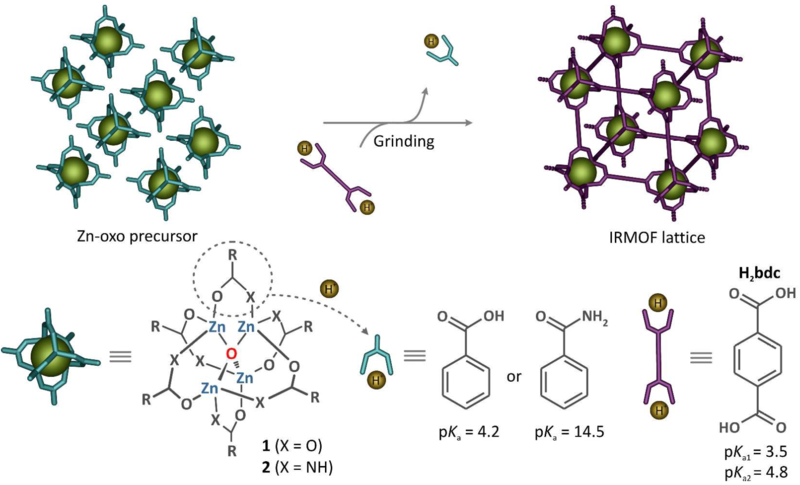 Even the synthesis of the archetypal and highly popular isoreticular metal-organic frameworks (IRMOFs), based on μ4-oxo-zinc [Zn4(µ4-O)]6+ secondary building units (SBUs), has remained a persistent challenge for mechanochemistry. Using the material MOF-5 (or IRMOF-1) as a model, we now demonstrate a We now describe the “SMART” (SBU-based Mechanochemical Approach for pRecursor Transformation) strategy that not only allowed the first successful mechanosynthesis of MOFs based on a complex SBU, but also provides access to a new fluorinated IRMOF material that has been inaccessible by conventional solution-based methods. This mechanochemical approach is SBU-based and employs pre-assembled oxo-zinc amidate clusters as rationally selected and previously unexplored precursors to IRMOFs.